The volume is maxed out, but that doesn't stop me from hitting the volume key on my Nexus 7 in hopes that it will magically get louder. This happens to me everyday as I watch videos or play music. The simple fact is that a Nexus 7 tablet just doesn't get very loud. At least, not loud enough for me. While you could attempt to use various equalizers or other third-party apps that claim to be volume boosters, today I'll be showing you how to settle this once and for all by adjusting your Nexus 7's volume at the system level, which noticeably increases the overall volume for the device. This mod is only for the Nexus 2013 model. Do not attempt to flash these on a 2012 model, or at least create a backup if you're feeling adventurous. To perform this mod, you will need full access to your tablet's system, which means you need to be rooted. If you haven't done so already, check out our always-updated rooting guide to get that process taken care of. After rooting your device, you will need to install a custom recovery on your Nexus so you can successfully flash the mod. 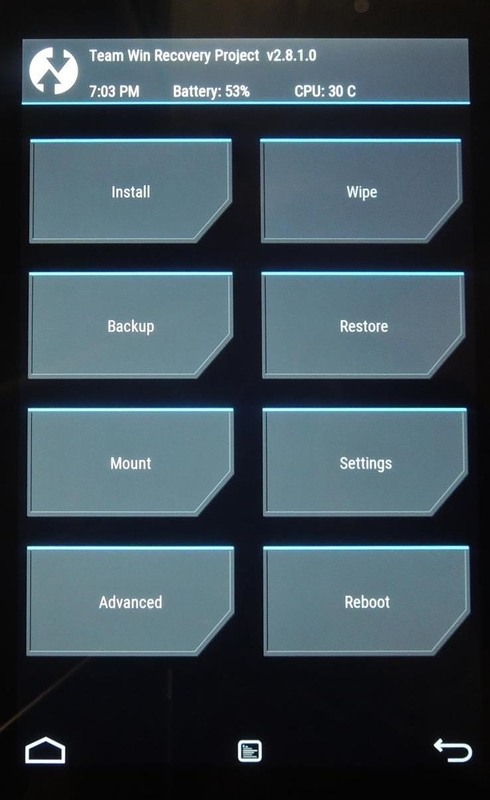 Take a look at our TWRP guide to get that started. Personally, 95 is the perfect level; it has the capacity to get really loud, but not too distorted, like 98. Volume level 90 isn't too much of an upgrade, but you can always download them all, test them out, and settle on the one that sounds best to you. With the ZIP files tucked away in your Download folder, enter your custom recovery to begin flashing—you can do this by powering down your device, then powering it back on by holding the Power and Volume Down buttons at the same time. 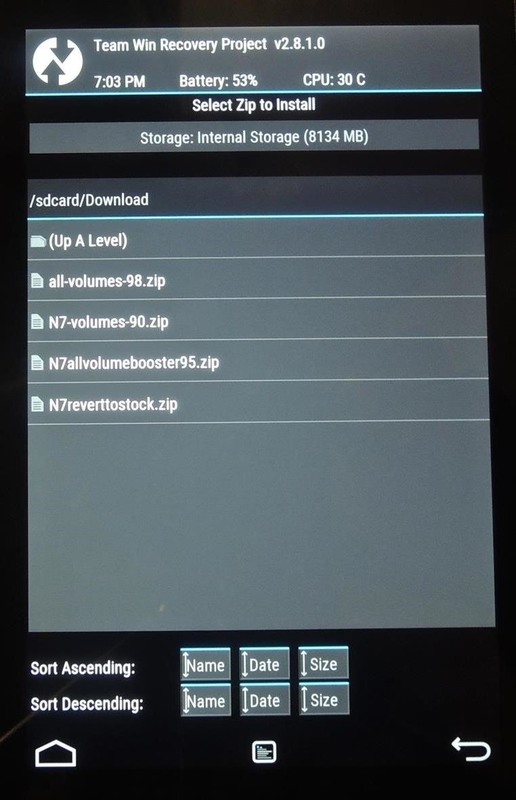 Once in TWRP, select "Install," locate the "Download" folder, and select the Volume ZIP file you chose to use in the previous step. Then just swipe to flash it. After your Nexus boots back up, test the volume levels by playing some music or a video. All of the volumes on your device will be higher, including system sounds, media, and headphone levels. Check out some other awesome ways you can improve the music listening experience on your Nexus, and let us know what you think of this hack, and which volume level you went with, in the comment section below.
? follow this guide on my nexus 7 2012, rooted ,twrp recovery and running stock lollipop.Unfortunately i lost all the sound!! !Even when i flash the -back-to-stock level zip!! !No sound at all..Any solution please?!!!?? Any chance you made a backup? I was also running Lollipop and TWRP, but had a Nexus 2013. I will need to test this out on the 2012 model and get back to you. Stupid me. No backup and now my Nexus 7 2012 is completely silent. Do you have an older backup that you can revert to? The guide has been updated to inform 2012 model users about the issue. Will this work with a Nexus 7 2013 with Android 5.0 Lollipop? Yes, and that's exactly what I had when I did it. I find that using it with headphones renders the best results, but yes, it can get distorted. Regardless, thanks for trying it out. 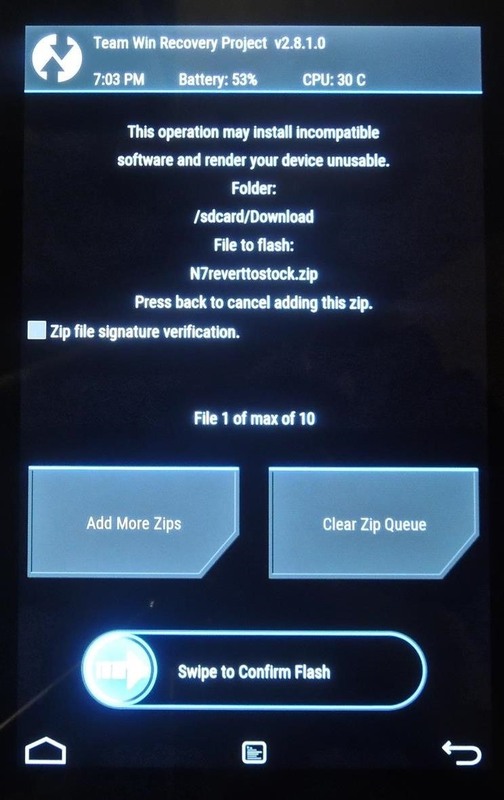 I unlocked and rooted my nexus 7 2013 using the toolkit but when I open TWRP to try to flash the audio zip file it says no OS! I made a backup before unlocking and one with TWRP after rooting, which one should I use and why this OS thing happened? Thanks! So were you able to restore your device? any chance to have your links back ? Hi Neil, wondering if you can put the like back up please, thanks. Links should be working now.